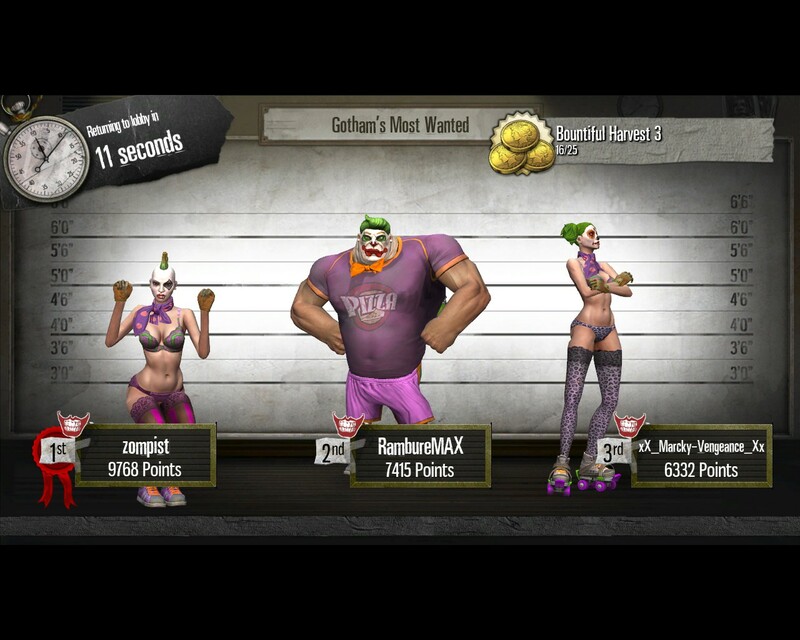 Some of my Steam friends have wondered why I play a lot of Gotham City Impostors, especially since you have to play with (shudder) pubbies. Well, part of it is because I’ve now got some skillz. Police lineup or burlesque? It’s both! My main weapon is the rocket launcher– as in TF2, the splash damage compensates for not having sniperish aiming skills. I quickly learned, however, to switch to the Chaperone submachine gun for close quarters. For gadgets, I’m addicted to the shuriken. You can throw three in quick succession; at 40 damage a pop this is often enough for a kill, even more so if you can throw in some weapon damage. Even better, it aims itself at any visible enemy; and when you ready it, visible targets get a big red X on the screen. This is intensely valuable since (unlike TF2) finding the enemy is a big challenge in Impostors. There are targeting goggles which will show enemy silhouettes, but the shuriken is almost as good. For movement gadgets I like the grapple gun, which not only allows climbing to high surfaces but allows very fast movement. You can even grapple into enemies to damage them, though this is risky for Nimbles as it’s rarely a kill. On the whole the Impostors maps, though not large, offer a wide range of paths, and sometimes I can go catch a group of enemies from behind. So, basically, it has a lot of the humor of TF2, it’s aimed at non-pros but does have strategy and tactics, and it’s just novel enough to keep my interest. If the developers keep working at it, I think it could get even better. But I don’t know if it’ll get the chance. Sometimes there’s not enough players to try some of the game modes; plus the fact that “parties” don’t work means you can’t play with your friends, which is insanely broken. It’s also a minus that the servers are all hosted by the developer, which means it’s all random pubbies all the time. 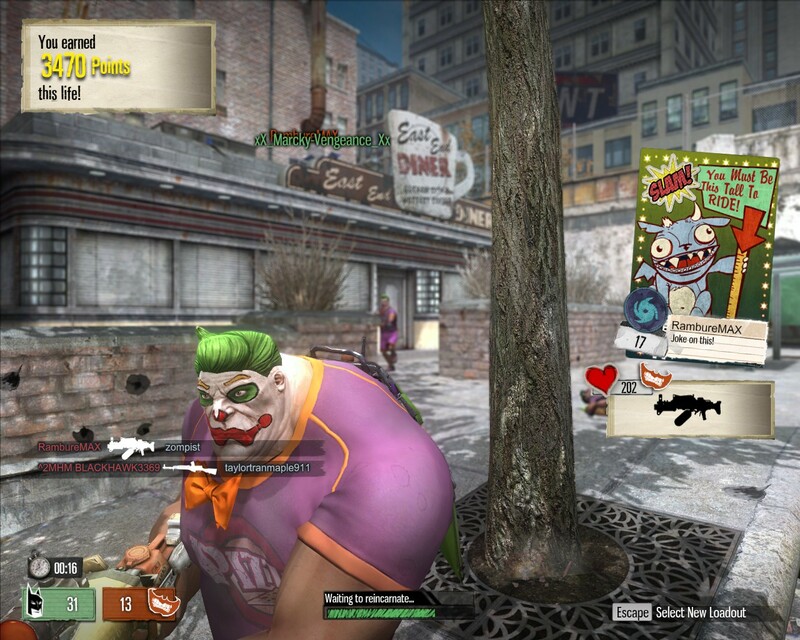 In TF2 you have private servers, so you can get to know a group of players and actually apply some team tactics. Speaking of tactics, though I like Fumigation mode, I’ve come to appreciate Bounty Hunter, where players drop a coin when they die, and you win based on coins collected. It adds an interesting additional mechanic to deathmatch, becuase you don’t just have to kill someone, you have to collect the coin. So e.g. long-distance sniping, or killing someone in the middle of a knot of friends, are pretty much a waste since you won’t be able to collect the coin. As a result you tend to get a higher level of play in this mode. I wish they’d add more costumes, though. I have over 11000 coins and nothing worth spending them on.